Northern Star co-boss Dom Genovese wants his players to respond to one cup final disappointment by reaching another. The city side missed out on Northants Hillier Senior Cup glory when being beaten 4-1 by Brackley Town at Sixfields on Tuesday night. Star paid the price for a catalogue of missed chances as they failed to claim the county crown, but they have an opportunity to make amends when hosting big local rivals Yaxley in a Hinchingbrooke Cup semi-final at the Mick George Arena on Saturday. Genovese said: “We had just as many, if not more, chances than Brackley, but we couldn’t put ours away. “The lads were very disappointed and hopefully they can put it right on Saturday. “I’m expecting a response in what is another huge game for us. Yaxley have received a major blow after losing goalkeeper Aaron Butcher to a broken collarbone. The Cuckoos have drafted in Mark Osborn, a former Kettering, Corby and Halesowen shot-stopper, as emergency cover for the remainder of the campaign. But they have been boosted by the return of influential midfielder Robert Hughes from a six-week ‘retirement’. Deeping lie in wait for the winners of the Northern Star v Yaxley tie in the Hinchingbrooke Cup final on May 11 at Huntingdon. Yaxley also have a Hunts Senior Cup final against Godmanchester Rovers at Huntingdon on May 15. 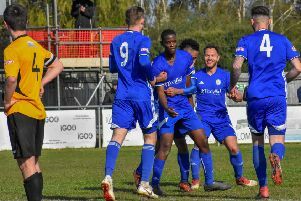 It’s win or bust for AFC Stamford in their battle against relegation from the Evo-Stik League Northern Premier Division on Saturday. The Daniels must achieve their first ever league victory at the Zeeco Stadium against Witton to stay up and relegate their opponents.